MCDK should not be confused with polycystic kidney disease (PCKD) or other renal cystic diseases. Spence recognized MCDK as a distinct entity in 1955. In 1986, the Urology Section of the American Academy of Pediatrics established the National Multicystic Kidney Registry, which is a large, multicenter, longitudinal database that has helped clarify the appropriate management of MCDK. 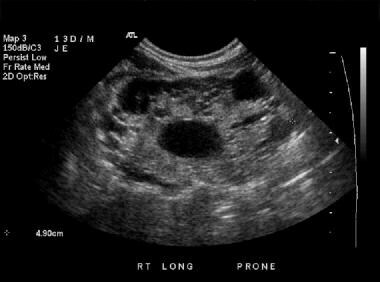 In a patient with a symptomatic presentation, such as a palpable abdominal mass, abdominal pain, incontinence, and recurrent urinary tract infections, sonography should be the initial study. 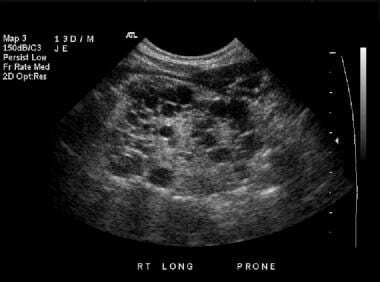 The sonographic information provides clues of other urinary tract anomalies as well as intra-abdominal or retroperitoneal malignancies. MCDK can be detected on other forms of imaging, but sonography is fast and accurate, and it does not require sedation, radiation, or other interventions. 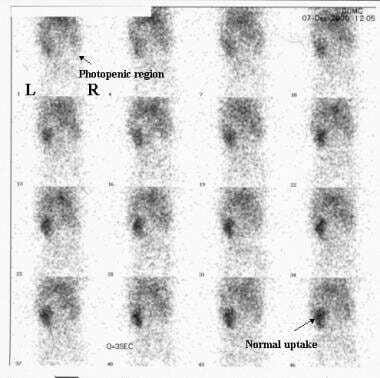 Radionuclide imaging can be used to further differentiate the hydronephrotic form of MCDK from an obstruction in a functioning kidney. Radionuclide imaging provides information about the function of the involved renal unit and is superior to intravenous pyelography (IVP) in children. Technetium-99m (99mTc) mercaptoacetyltriglycine (MAG-3) and 99mTc dimercaptosuccinic acid (DMSA) studies can demonstrate lack of function in the affected kidney, but MAG-3 studies can also provide information regarding drainage in an obstructed hydronephrotic kidney. Voiding cystourethrography (VCUG) is indicated in patients with MCDK to evaluate the urinary tract for vesicoureteral reflux (VUR) and other anomalies. Although a minority of patients will have this defect, VUR could lead to reflux nephropathy in the contralateral solitary kidney; therefore, it is important to perform a VCUG to detect a potentially damaging, but easily correctable, cause of renal damage. The hydronephrotic form of MCDK can mimic ureteropelvic junction obstruction (UPJO), and radionuclide scanning is necessary following sonography to confirm the diagnosis. Renal function is relatively poor in the first month of life, and radionuclide imaging should be postponed until 1 month of age to avoid false-positive results. Incidental findings on kidney, ureter, and bladder (KUB) images include displacement of the bowels when the affected kidney is enlarged (see the image below). Also, ringlike calcifications of the cyst walls may be seen on plain images. Retrograde pyelography may demonstrate an atretic or absent ureter. MCDK can be an incidental finding, but computed tomography (CT) scanning studies are not part of the diagnostic investigation. They show the typical multicystic appearance of MCDK with little or no parenchyma. 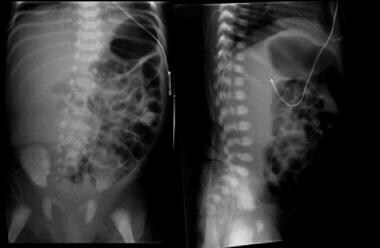 Cyst wall calcification can be seen. If a contrast-enhanced CT scan is performed, there is no excretion seen. 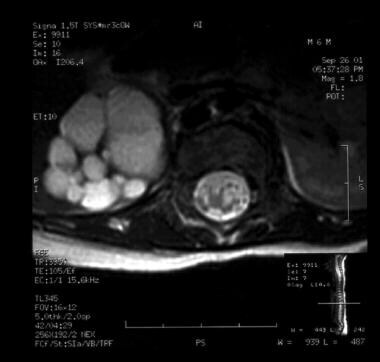 A T2-weighted MRI scan demonstrates multiple cysts without normal renal parenchyma. A normal left kidney can be seen on the other side of the spine. 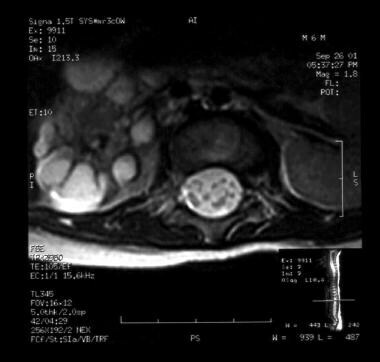 A T2-weighted MRI scan of the same patient as in the previous image demonstrates multiple cysts without normal renal parenchyma. A coronal prenatal sonogram of the retroperitoneum shows both kidneys. The cystic hypoechoic area is the right multicystic kidney. The normal kidney looks slightly hypoechoic and lobulated. A prenatal sonogram shows the right multicystic dysplastic kidney in a longitudinal view. The spine underlies the affected kidney. If MCDK is indicated on prenatal sonograms, postnatal sonography (shown in the images below) should be completed before the patient is discharged home from the hospital. The diagnostic criteria for postnatal sonography are the same as those for prenatal sonography. 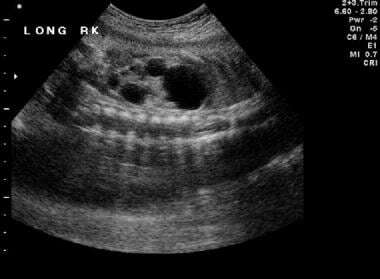 A longitudinal sonogram of the right kidney shows multiple diffuse hypoechoic renal cysts, without any significant normal renal parenchyma. A Longitudinal sonogram of the right kidney shows multiple diffuse, hypoechoic renal cysts, without any significant normal renal parenchyma. Ultrasonography is an excellent diagnostic test for MCDK, with a high degree of confidence. 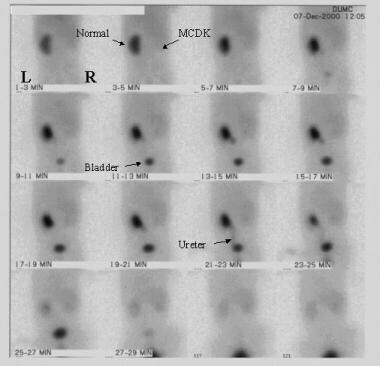 An obstructive uropathy with little renal parenchyma can mimic MCDK, but radionuclide studies can provide confirmation of the diagnosis. Autosomal recessive PCKD is not usually mistaken for MCDK, as the cysts in PCKD are too small to be visualized on sonograms, and the parenchyma is generally homogeneously hyperechoic. Other cystic diseases typically appear with some functional parenchyma. 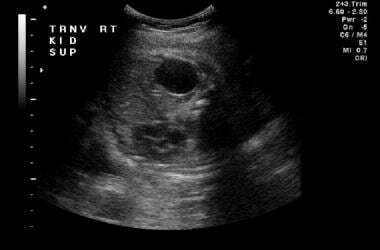 The greatest source of false-positive errors occurs in the setting of hydronephrosis or UPJO. A reniform shape and/or a large cystic structure in the medial portion of the kidney are more indicative of hydronephrosis than MCDK. Unlike in hydronephrosis, where there is communication with the central renal pelvis, the cysts of the classic form of MCDK do not communicate. Regarding false-negative results, renal agenesis with non-renal cystic structures in the retroperitoneum (eg, an adrenal cystic mass) could potentially be mistaken for MCDK. Initial perfusion images from a nuclear renal scan. Note the normal uptake and concentration of the radiotracer in the left kidney. No uptake or concentration of radiotracer is seen in the right MCDK, leaving a photopenic area in the right renal fossa. More delayed images from the same renal scanning examination as in the previous image shows a concentration of radiotracer in the normal left kidney and excretion into the left ureter and bladder. Uptake of radiotracer in the right multicystic dysplastic kidney is minimal. Nuclear medicine studies are the best imaging studies for differentiating between MCDK and hydronephrosis; however, severe hydronephrosis with poor renal function may still be difficult to distinguish from MCDK. The similarity may not be clinically relevant because reconstructive surgery is usually not indicated in the setting of poor (ie, < 10-15%) differential function. MAG-3, diethylenetriamine-pentaacetic acid (DTPA), and dimercaptosuccinic acid (DMSA) are the preferred agents. Tests with these agents are sensitive for detecting renal function, but the anatomic resolution is relatively poor. Other forms of imaging are required to visualize the specific anatomy of the kidney. On a nuclear renogram, anything that impairs the renal circulation, such as a renal artery stenosis or a renal vein thrombosis, appears as a nonfunctioning kidney; nevertheless, the renal parenchyma should appear relatively normal with ultrasonography. In addition, renal agenesis may mimic the nonfunctioning kidney of MCDK, but the tissue is absent on sonograms. False-negative results may arise in the setting of severe hydronephrosis. In a poorly functioning kidney, the intervention is the same as in MCDK; therefore, discriminating between these 2 disorders may not be imperative. Angiography is not indicated for the evaluation of MCDK; however, if catheterization, CT scanning, or magnetic resonance angiography (MRA) is performed, the ipsilateral renal artery is atretic or absent. Kiyak A, Yilmaz A, Turhan P, Sander S, Aydin G, Aydogan G. Unilateral multicystic dysplastic kidney: single-center experience. Pediatr Nephrol. 2009 Jan. 24(1):99-104. [Medline]. Schukfeh N, Kuebler JF, Schirg E, Petersen C, Ure BM, Glüer S. Dysplastic kidney and not renal agenesis is the commonly associated anomaly in infants with seminal vesicle cyst. BJU Int. 2009 Mar. 103(6):816-9. [Medline]. Singh JK, Kanojia RP, Narasimhan KL. Multicystic dysplastic kidney in children--a need for conservative and long term approach. Indian J Pediatr. 2009 Aug. 76(8):809-12. [Medline]. Schreuder MF, Westland R, van Wijk JA. Unilateral multicystic dysplastic kidney: a meta-analysis of observational studies on the incidence, associated urinary tract malformations and the contralateral kidney. Nephrol Dial Transplant. 2009 Jun. 24(6):1810-8. [Medline]. Hussain S, Begum N. Multicystic dysplastic disease of kidney in fetus. J Ayub Med Coll Abbottabad. 2007 Apr-Jun. 19(2):68-9. [Medline]. Cardona-Grau D, Kogan BA. Update on Multicystic Dysplastic Kidney. Curr Urol Rep. 2015 Oct. 16 (10):67. [Medline]. Wiener JS. Multicystic dysplastic kidney. Belman AB, King LR, Kramer SA, eds. Clinical Pediatric Urology. 4th ed. London: Taylor & Francis; 2002. 633-45. Levine E, Hartman DS, Meilstrup JW, Van Slyke MA, Edgar KA, Barth JC. Current concepts and controversies in imaging of renal cystic diseases. Urol Clin North Am. 1997 Aug. 24(3):523-43. [Medline]. Spence HM. Congenital unilateral multicystic kidney: an entity to be distinguished from polycystic kidney disease and other cystic disorders. J Urol. 1955 Dec. 74(6):693-706. [Medline]. Whittam BM, Calaway A, Szymanski KM, Carroll AE, Misseri R, Kaefer M, et al. Ultrasound diagnosis of multicystic dysplastic kidney: is a confirmatory nuclear medicine scan necessary?. J Pediatr Urol. 2014 Dec. 10 (6):1059-62. [Medline].